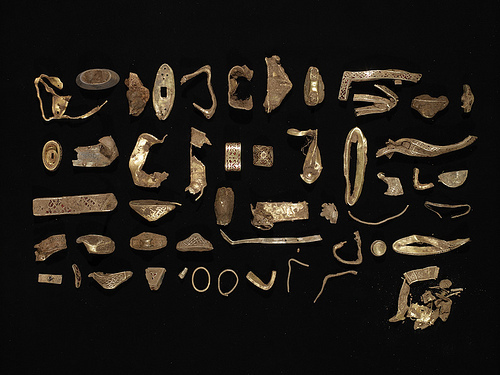 The largest discovery of Anglo-Saxon gold and silver has gone on show at Birmingham Museum. 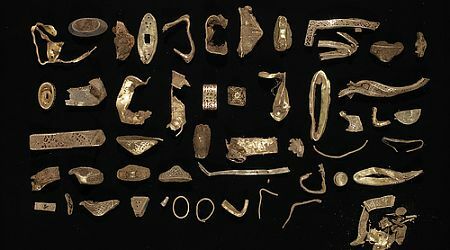 This amazing discovery was uncovered in early July 2009 by a metal detectorist and subsequently reported to the Portable Antiquities Scheme. A full archaeological excavation was conducted by a team from several institutions and the results of this have been released. You can read about the discovery and view objects here and you can interact with photos from the hoard on the PAS Flickr site. …this is going to alter our perceptions of Anglo-Saxon England in the seventh and early eighth century as radically, if not more so, as the 1939 Sutton Hoo discoveries did; it will make historians and literary scholars review what their sources tell us, and archaeologists and art-historians rethink the chronology of metalwork and manuscripts; and it will make us all think again about rising (and failing) kingdoms and the expression of regional identities in this period, the complicated transition from paganism to Christianity, the conduct of battle and the nature of fine metalwork production – to name only a few of the many huge issues it raises. Absolutely the metalwork equivalent of finding a new Lindisfarne Gospels or Book of Kells. Any questions should be directed to the PAS office on 0207 323 8611. Kevin Leahy, the Scheme’s National Finds Adviser for Early Medieval metalwork is leading the intepretation of the hoard, assisted by the partner organisations listed on the Portable Antiquities Scheme website.